Harare - Soon after making a historic move from KV Oostende to Belgian giants Royal Sporting Club Anderlecht on a four-year deal, and a chance to play in the UEFA Europa League - Knowledge Musona explains how he got the nickname Smiling Assassin at Kaizer Chiefs. Musona had spent the last four years at KV Oostende, making 110 appearances, scoring 39 goals, including a cheeky back heel in his final game for the club at the weekend in the 3-1 win over K.A.S Eupen in a fitting farewell to his fans. From a stadium of 6 500 to join one that plays in a ground that has a capacity of 21 500 and will be moving into the 60 000-capacity Eurostadium next year, which they will share with the Belgian national team. During his days at Kaizer Chiefs, Musona was nicknamed the Singling Assassin. “The nickname Smiling Assassin came from South Africa, that’s how I got it, always when I used to play I used to smile and whenever the referee said something or blow the whistle against me. Musona is determined to make a difference. “For me, the most important thing was to get a good club with a good history and a club that is winning titles and I’m happy I’m here and Anderlecht is a big club in Belgium and I was fortunate that I had to meet the president again, for the second time, Luc Devore,’’ Musona said in his first interview with Anderlecht TV. “I’m happy, we have to deliver, we have to make sure we play to a high level, to keep the standards high. We cannot afford to be going up and down. “We have to be consistent and in a big team like this, this is what you are expected (to do) every week and every day. “I think there will be more fans from Zimbabwe who will start to support Anderlecht because they really love me in Zimbabwe and also in South Africa and so, yeah, it’s something very special to me and I’m looking forward to it. In signing Musona, Anderlecht beat Jupiler rivals Standard Liege, who had in the last few months been angling for the former Kaizer Chiefs striker’s signature. 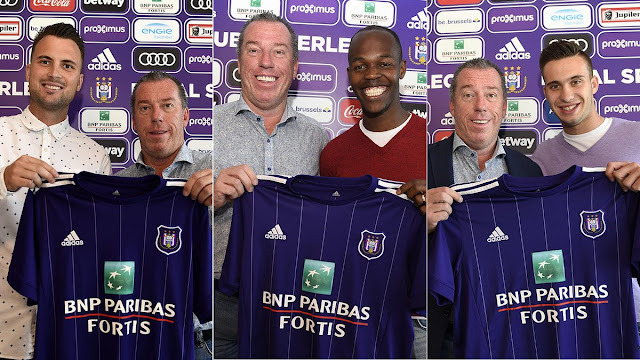 Anderlecht confirmed the capture of Musona and that of defender Antonio Malic, who also arrives from KV Oostende and Serbian Luka Adzic, with the club describing the Warriors’ talismanic forward as “technically gifted player”.